The TRIC case not only offers acoustic and semi-acoustic guitars unparalleled protection against the usual "bangs & bumps" in the everyday life of a musician, but also offers up high-tech protection from the elements. Made of Expanded Polypropylene, which is the same shock absorbent, high-tech material used by the automotive industry in bumper cores, it can also be found in the manufacturing of bicycle helmets. The high impact resistant material trusted to save the human head is now available for your acoustic guitar. TRIC stands for "Thermally Regulated Instrument Case." Drastic changes in climate and temperature can play havoc on an acoustic guitar and the TRIC case offers protection like never before against the elements. The TRIC case is temperature tested to -35C (-31F) and up to +65C (+150F), proving this case can withstand extreme conditions, all the while leaving your guitar sheltered and protected in its very own comfortable climate zone. The Ultra-lightweight characteristic of the TRIC case makes it a breeze to carry, especially with its comfortable and durable easy-grip handle. It offers all the protection of a flight case at a fraction of the weight. As light as a gig bag, the TRIC case weighs in at just under 3.65 pds. To accentuate the ease of carrying this case it features pre-installed D-rings for a shoulder strap. Who would have thought! 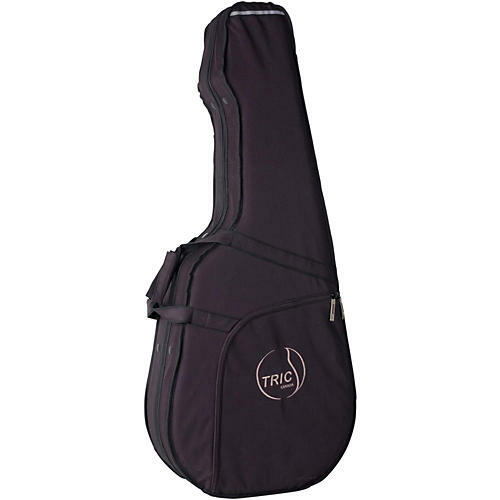 Carrying a guitar case over your shoulder¦ without the aches and pains! Hermetically sealed tongue and groove fitting, all the way around the case. Durable and rugged nylon outer shell with easy-grip handle and shoulder straps, making "over the shoulder" transport a simple and lightweight reality! Convenient interior storage compartment with durable flap and exterior storage pocket. Arched deflector shield reinforces the top while leaving breathing room for the bridge. Plush interior with moulded interior shell helps suspend and securly hold guitar in place.